If I have to share with you my biggest tip for Christmas it is making a battery list as you are purchasing your gifts. Why you may ask? Thinking back to Christmas eve about 15 years ago I was wrapping Christmas gifts for my children only to remember that I had not purchased any batteries. My husband and I rushed out on a search for batteries before the last variety store in our area closed for the night. We were lucky enough to find some batteries for the toys we purchased but I do not want to see anyone else in the same situation as us. So please please please make a battery list you will not regret it!!! Since you are making a battery list I would like to introduce you to Duracell Quantum, the world’s most advanced alkaline battery. 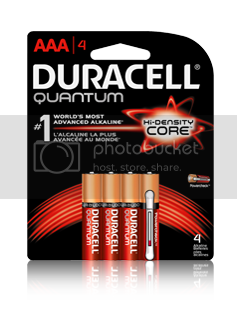 With its revolutionary Hi-Density Core and proprietary PowerCheck power indicator, Duracell Quantum has been engineered to deliver the performance consumers demand, offering long-lasting power when it’s needed the most. Whether it’s powering children’s toys or first responders’ radios, you can always count on Duracell’s most powerful premium-tier battery when it just has to work. And, did you know? Duracell DURALOCK technology locks in power for up to 10 years in storage! You can also download a free app to have a Furby Boom adventure and translate Furbish. Take care of your Furby, get virtual eggs and hatch and raise the Furblings! The Furby app is optional and works with iPad, iPod touch and iPhone with iOS 5.0 or later (devices sold separately). The app is not compatible with prior Furby generations. Check Furby.com for device compatibility.